Two Californias explores for the first time the pervasive folk myth that Northern and Southern California should really be separate states. You hear it all the time in the media and on the street - but is it true? Michael DiLeo and Eleanor Smith look closely and discover that there are profound truths embedded in the folk tradition. And equally profound misconceptions. 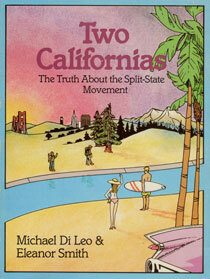 Probing the surprising and little-known history of the split-state movement, the authors find that its underlying sentiments have been part of California politics and culture since territorial days. What the issues are today, what their implications are for our lives in the 1980s, and what we can do about them are the focus of this fascinating book. The current water controversy, perhaps the most crucial in the state's history, cannot be resolved until the two Californias make peace with each other. No other book confronts the environmental and philosophical problems that plague California and have nationwide echoes as thoroughly and as intelligently as Two Californias does. Two Californias is entertaining – and it also thought-provoking. It is very likely to change the ways we think about living together and sharing resources in the 1980s.